The chair operate from the power provided by a standard electrical outlet and only use a nominal amount of power during operation. No special connections are needed. 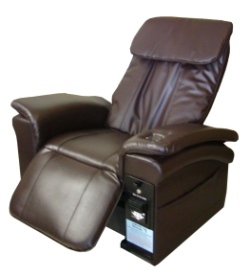 Rear wheels help to easily maneuver and relocate the Lounge Massager Vending Massage Chair if necessary. The Lounge Massager vending massage chairs can be disassembled in sections in less than five minutes and Installation is fast and easy. A Lounge Massager Vending Massage Chair placed in a business or organization is an efficient way for the owner to earn additional income as commission with no risk, additional work, or capital on their part. It is also an excellent way to provide customers, patrons and members with a unique, safe way to relax while they wait. Lounge Massager vending massage chairs can be placed in warehouses, factories, office lobbies, hotels, shopping malls, casinos, beauty salons, nail salons, club and meeting halls, health clubs, car washes, church fellowship halls, hospitals, airports, and many other locations.